- Spring green candle, scented with citronella, clove, lemon balm, nutmeg and cinnamon. "May an abundance of goodness flow freely into my life. Allow me to be receptive to the treasures that present themselves, enriching my life's journey." When the time is right to visit your sacred space, these are the candles to use to light your way. Each of our herbal magic candles has been designed with a specific intention using a unique blend of essential oils created by Crystal Journey. Each candle comes with an affirmation and inspirational message. Handcrafted in New England. Made with natural, metal-free wicks. Pillar candles are 7" tall and 1 1/2" in diameter. 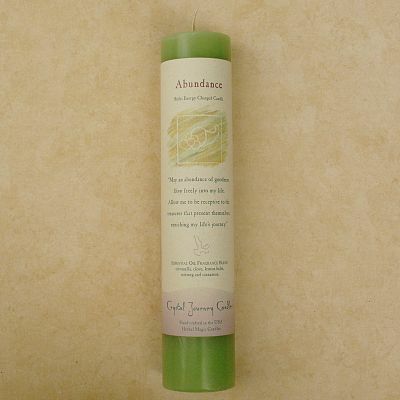 Do you have any other questions about our Reiki-Charged Abundance Pillar Candle?